I Hate Binding...and that's why I Love Coverbind! 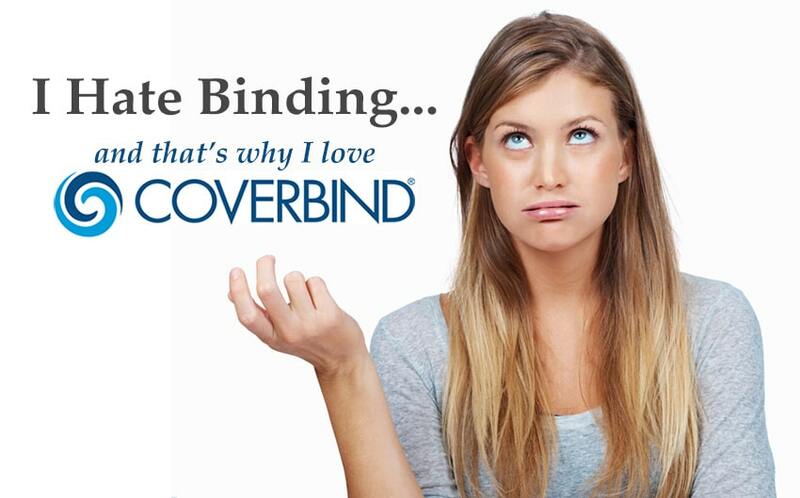 Confession time...binding is a hassle! It is time consuming, boring, tedious, frustrating, and just thinking about punching page after page after page makes my back and shoulder ache! The reality of daily book binding is that... I hate it! Let me clarify....because what I actually mean when I talk about how much I love binding in other posts is how much I love what a finished bound book looks like...THAT is the thing that I love. But the actual binding process itself...if I'm totally honest, it is kind of...blah! And that is why I breathed such a sigh of relief when I heard about Coverbind. I always preferred thermal binding to the other methods because of it's simplicity, and the fact that it doesn't require any punching (hallelujah!) but there were issues in the past with pages falling out, or with a limit of what your covers can look like. Coverbind, however, addressed both of those concerns with their new innovative covers. Better Bind: Coverbind still has the convenient pre-applied glue strip in all covers, which eliminates the need to apply any messy glue. But what is new is their mesh embedded strip that works with the strong binding glue to grab each individual page and pull them deem into the spine. More Cover Options: Now you can choose from more than just plan spines, sift covers, and hard covers...instead, you have 4 different kinds of soft covers and 3 different kinds of hard covers (including with windows and customizable covers). This also includes some binding covers up to 2" thick...the thickest thermal binding cover available. In addition to the innovative covers, they have also created a new line of automated thermal binding machines that are the only machines in this new segment, finally bringing more speed and efficiency so even large businesses who bind many documents per day can use thermal binding as efficiently as possible. The video below is their top of the line machine, the Accel Ultra. In addition, they have a smaller Accel Cube that is also automated, as well as an office-level Accel Flex, which is manual like traditional thermal binding machines. Below that you will also find a video showing you quickly the kinds of covers available so you can see just how versatile they are. So what do you think?! Easy, huh?! And SO fast! Are you ready to try one yourself? Questions? We're here for you! Give our expertly trained sales team a call at (866)537-2244 (866)537-2244 for more information on these, or any other kinds of bindings. You can also email us at info@buy101.com. Coupon code is subject to change without notice. Limited time offer, and may expire at any time. Discount will apply to all applicable Coverbind products on your order. Coupons (whether listed on this page or elsewhere) cannot be combined with any other offers or discounts, including (but not limited to) additional coupons, bulk discounts, special discounted quotes, price match quotes, resale or wholesale quotes, etc. Coupons must be used during the ordering process, and cannot be applied to any order after it has been placed, shipped, or delivered. Questions? Click "live chat" on your screen, email info@buy101.com, or call (866)537-2244 (866)537-2244 to speak with a customer care specialist.